The whole trip costs Php 8,850. It includes 2 way bus ride, overnight stay at Amor, all meals, the whaleshark encounter, firefly watching, and 3 dives at Manta Bowl. For non-divers, the package is at Php 5,150. After I checked the accounting of Deats and Nina who were on there a couple of weeks earlier, I decided it’s a very good deal considering everything is being taken care of. Due to the declared holiday that weekend, the party grew significantly and so we were divided into 2 groups leaving from 2 different bus terminals. The Casagwa Royal Elite bus looks great. It was spacious with only 3 people in a row and looks quite promising for an 11-hour ride. I’ve been on a long haul flight and an overnight coach, but yet on a bumpy bus ride for this long. But I came with a book, pillow, and mineral water, which I shouldn’t drink too much from as the bus has no loo and we were told that the 1st stopover will be a while. 11 hours later, we arrived in Legaspi, impressively on schedule but not without mishaps. Everyone except us in the bus knew where they were and were each getting off at their respective stops around the small town. We were to get off at the satellite terminal where we’ll meet the gang from the other bus. And where 2 vans were supposed to be waiting to take us to our resort. I guess the problem lies in that the terminal didn’t look anything like a terminal. It was more of an empty parking lot with an old pumping station. So we didn’t get off. Many meters later, we were the only people in the bus so Beth went to have a few words with the driver and immediately, the bus stopped to let us off –in the middle of Nowhere, Legaspi, Bicol. Fortunately, Nowhere has a small ‘bulalohan’ where we had our horrible instant coffees and “practice” breakfast. Shortly after breakfast, the van found us and we were on our way to our supposed destination. It was a winding but scenic 1-half hour ride from Legazpi to Donsol with the majestic view of Mayon Volcano outside the window. We arrived Amor Resort around 8:30AM where we had our “real” breakfast, buffet style. We met with the group and Ging, the organizer, who’s cool and composed despite the glitches. It can be challenging to keep 28 people informed and in place. One of the resort staff walked us to the tourist center where we register for the whaleshark encounter. A boat can sit 7 people so our group needed 4. Because it’s high season and a long weekend at that, the waiting took a while. But finally, it’s our turn! A Butanding Interaction Officer (BIO) introduced himself and walked us to our boat. A boat has a BIO, an elevated spotter, and a couple of boatmen. The spotter will “spot” for whaleshark, then the boat will go there, and then the BIO will give us the signal to jump in the water. And then, swim (for your life) after the whaleshark! We had 3 encounters. 1 while on the boat and a whaleshark swam passed us, JAWS style, with just the fin above water but too fast that we didn’t even have time to jump in. Then the boat was charging somewhere and everyone got really excited, dying to go in the water. And finally we were told to jump! And so we did! I followed the BIO and finned and swam as fast and hard as I can. And finally, as if in slow motion, a giant white-spotted creature glided beneath me, less than 3 feet away. It was only a few seconds but it seemed to dragged on very slowly. I was transfixed and completely mesmerized the entire x seconds, could have been an hour. It was great because it was swimming towards us and we didn’t have to chase it. I stayed still and watch the whole length pass beneath me! What an amazing experience it was! We jumped in a few times and I had another encounter after but not as great, because it was deeper and farther down the water. I was never good at threading in the water, but it was fun finding out that with fins, it’s easy to keep afloat. But I have problem swimming with snorkel while chasing the whale shark because I kept forgetting and breath through it thinking it was a regulator. So I just stopped using it all together. To sum up, I had 3 sightings, other had 2 only, one of the girl didn’t see 1, curious for she was always the first to jump in. The earlier boat saw 5. We were told that earlier in the morning is better because by mid-morning there are usually too many boats and this makes the whale sharks less social. I highly recommend this experience! I will definitely do this again next year! The other highlight of this trip is the dive in Manta Bowl. I’ve been addicted to diving since I started about 6 months ago. I used to jumped at every opportunity to dive. But later, it has taken its toll on my pocket, so I now I’m a bit choosy (not much but I try). Manta Bowl is a submerged reef located in Ticao Pass, about 2 hours boat ride from the resort. It was discovered a few years back that large pelagic are brought in by the strong current. People come here to dive with large pacific manta rays (according to the internet). Current here is known to be really strong and we were all advised to bring our own reef hook and balloon. And also, to expect that most entry is done negative. This makes me very excited, but a bit nervous. 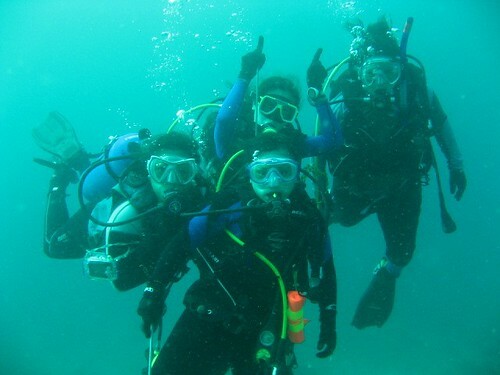 We were 6 divers who took this option while the others either did the whale shark encounter again or went snorkeling. The divers whom I will spend many hours on the boat with are Zara (dived with all the time), Beth (dived together once, but hang with many times), Kat (from Davao), Stephen (who inspired my Canon G9), and Neil (a young dive instructor), and Ray DM of Ticao and Anilao. On our first dive, the swell and current at the surface wasn’t that strong that we didn’t even have to do negative entry. 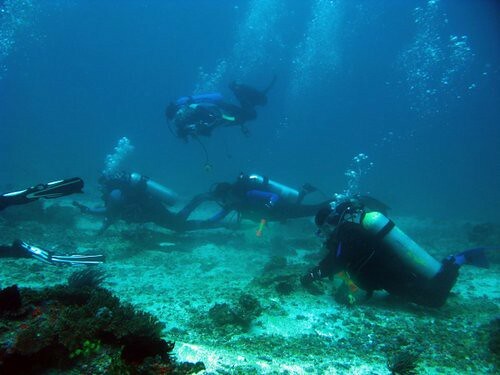 But wow, when we get to the bottom (about 70ft), the current was so strong that we had to use reef hooks. The current also threatened to wash away my mask and regulator mouth piece. We were crawling, almost kissing the ground againts the current hoping to have the mantas washed toward our direction. Ray claimed to have seen a manta but said it was so fast. I was behind him but didn’t see anything. The water was a plankton soup and murky as hell. We had to be still and kept wide eyed so as not to miss anything. No luck again on the 2nd dive but Neil saw a small stingray. We ate our packed lunch at the boat and had a little siesta. ight that manta rays sighting is not guaranteed here. After 2 dives, we were all a little discouraged and bored. Kat said she wants to skip the 3rd (and last) dive. I was very tempted but I know I wont. Finally all of us went in anyway, because none of us want to be the only one who didn’t see mantas.. The 3rd dive current was as strong as the 1st one, and as soupy. My regulator mouth piece finally gave way and broke, so I had to switch to the octopus underwater. The 1st 2 dives, we spend a lot of time parked and waiting, but this time, the DM was more determined so we were moving more. This time the scene is also a bit more interesting. There were some nice corals and fishes. Then we saw a white stingray and then shortly an eagle ray, but some of them didn’t see it as it just zoomed pass and viz was very bad. Everyone was ecstatic coming to the surface, except Stephen who experienced vertigo and had to ascend accompanied by Neil, but fortunately not before having a good look at the manta, and even took photos from a few feet away. So that leaves 4 of us ladies cheering and DM Ray who took a billion of photos of us. Coming back to the boat we realized we have a new dilemma. We finished the dive around 3:30 pm but we have a bus to catch at 6:30 pm! Remember the boat ride takes 2 hrs plus the winding, scenic 1.5 hr drive to the bus terminal? Yes, Amazing Race, Donsol Edition! We got to the resort at 5:30 pm but we were all mentally packing during the 2 hour ride. Once we stepped on the ground, we ran like hell. I took off my wetsuit in a 5 second shower. Found our bags packed (thanks to Riva). Changed into dry clothes (underwear and all) at the dining bench beside the van. Run to get my gears and had the presence of mind to have my dive log stamped. Haaha. The non-divers are already on their way to Legaspi. Very, very, very impressively, 10 minutes later, we were all in the van, Kat and Beth, still in wetsuits as they were staying in a different hotel, holding on to our dear lives, as the crazy F1 driver sold his soul (and ours) to the devil, to get us to our bus!! In the end, Beth and Kat had no choice but to stay another night for it’s impossible for them to go back to the resort in Donsol and back to Legaspi to catch any bus the same day. As for us with bags but no tickets, Ging was able to negotiate the purchase of new tickets allowing them to refund the unused ones. Nice. The next day, Beth and Kat will have the greatest whaleshark encounter ever! They will swim with the gentle giant for 1 – 1/2 hours straight. They will get tired before the whale shark. SO I guess all’s well that ends well. Photo credit goes to my travel mates: beth and stephen. Balik ka tapos sama ako sa Manta Bowl! :) Pleeeeeeease!